Discussion in 'Action Figures' started by beaker, Mar 23, 2009. 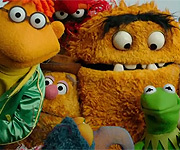 Thanks to the advent of google, muppets wiki, ebay, and our own BlueFrackle...over the years I've remembered seeing some of the straight up rarest Muppet(and related franchises) figures/pvcs/etc to date. The first Muppet figures...51 years ago! Thanks so much for this post. I really enjoyed looking at these photos. My daughter said "I want that one! That one! That one!" haha Good times. Those Electric Mayhem figures look cool. You forgot all the SS Palisades protos. Aww! Thanks for that. 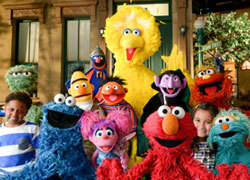 I also recall that right before Palisades got the Sesame license, another company(Fun 4 All?) showed prototypes of their Palisades-ish Sesame lineup. They're all sooooo cool... except for those Vila Sesamo ones... those ones are kinda ugly. But I'm really drooling over that Abelardo. Man, I wish SW would just sell some sort of set of international character PVC's or something. Best thing I saw was a Plaza Sesamo bib at Family Dollar.... Wonder of they had a Pancho too? I mean look at those Norwegian Sesame figures, talk about obscure. 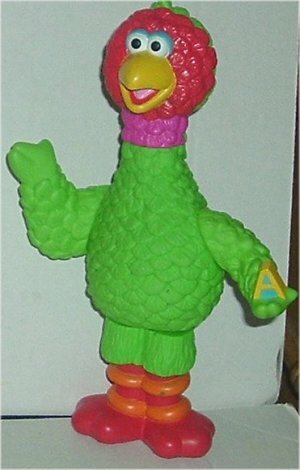 And oh yeah, from what I hear that early 70's Brazilian Sesame Street was...bizarre to say the least. I'm still so sad about Sal.... Johnny needs his monkey buddy! What is the rarest/hardest to find of the action figures? Its so sad Palisades went out of buissnes. When im looking at the SS action figures i want em all and they so nicely done. 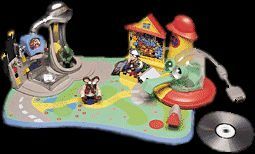 The Playsets from them are so nice too. Hard to beleave they went out of buissnes by selling such quality products. 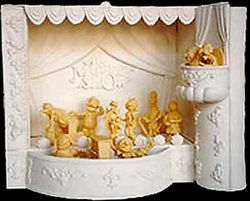 Was the Muppetstage shown in that links a prototype from Palisades ? It looks to fit well to the backstage set. Someone should pick up all that protos and produce more stuff.